A research group led by Dr. Yuichi Fujita, associate professor, and Dr. Ryoma Tsujimoto at the Graduate School of Bioagricultural Sciences, Nagoya University, has discovered a transcriptional regulator that controls nitrogen fixation in a cyanobacterium Leptolyngbya boryana. Their paper was published online in PNAS on April 21, 2014. 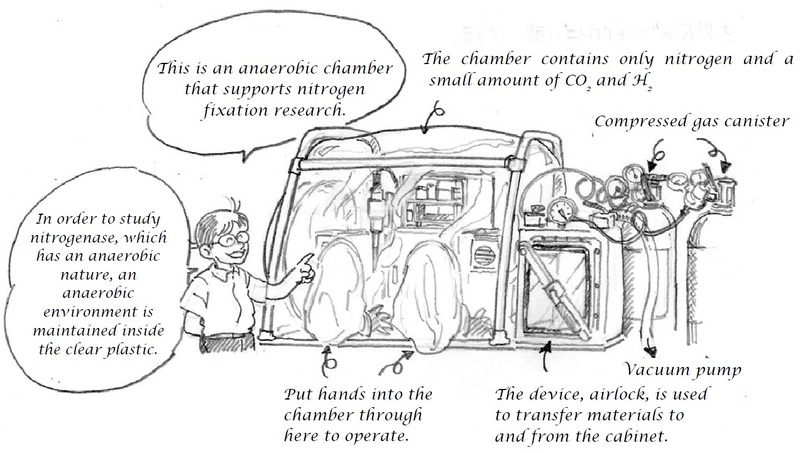 Nitrogen is an essential element for life. We, human, take nitrogen from food, which is derived from crops. Nitrogen exists as dinitrogen molecule (N2), and constitutes 80% of the atmosphere. However, many plants cannot utilize the atmospheric nitrogen as a nitrogen source. These plants receive nitrogen from compounds derived through nitrogen fixation, such as ammonia and nitrate. Tons of nitrogenous fertilizers are produced through industrial nitrogen fixation that subsequently increases food production to feed the world population, which has exceeded 7 billion. However, this process uses a massive amount of fossil fuels and energy, which is an environmental concern. Therefore, a new sustainable nitrogen fixation process that does not use chemical fertilizer has long been awaited. If we can elucidate a natural mechanism of biological nitrogen fixation and apply it to create a nitrogen-fixing crop, then it might be possible to increase food production without using the industrial process. Some species of cyanobacteria, photosynthetic prokaryotes, have nitrogen fixation activity that is driven by the enzyme nitrogenase, which is extremely vulnerable to oxygen. 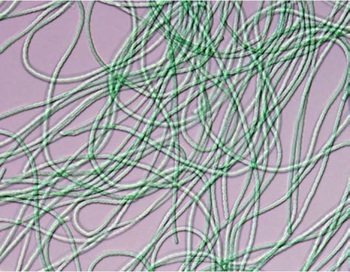 These cyanobacteria can perform nitrogen fixation and photosynthesis simultaneously, despite the anaerobic nature of nitrogenase. The mechanism that allows oxygen production by photosynthesis and nitrogen fixation to occur simultaneously has not been explained. Prof. Fujita's research group discovered a chromosomal part in the L. boryana genome that contains many genes related to nitrogen fixation. Among the 50 genes in this part, they selected interesting genes with unknown functions and isolated 11 different mutants, with each lacking the selected genes. Five of these mutants lost nitrogenase activity and could not perform nitrogen fixation. With further investigation, they discovered that one of the undetermined proteins activates transcription of genes for nitrogenase only after it senses that oxygen levels are low enough to allow nitrogenase to operate. 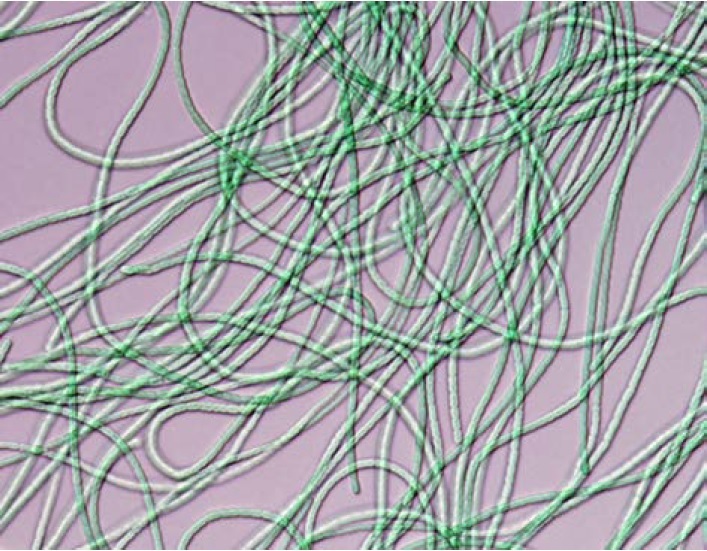 If the genes that participate in nitrogen fixation in this cyanobacterium can be implanted in plants, then the plants can grow well without using a chemical fertilizer. Once this protein (named CnfR) operates properly in the plants, they can perform nitrogen fixation only when they need nitrogen and the cellular environment is allowed to drive nitrogenase, which may prevent energy loss caused by excessive nitrogen fixation. The outcome of this research is expected to both enhance food production and address relevant environmental issues in the near future. This PNAS paper was recommended by F1000prime, an online service in which internationally distinguished researchers recommend important articles in medicine and biology. Associate Professor Yuichi Fujita has interacted with insects and plants since his childhood, when he often captured crickets and grew vegetables. As a high school student, he was moved by the documentary "COSMOS" (produced by Prof. Carl Sagan, a famous astronomer in the USA), which beautifully documented and introduced the history of the universe, extraterrestrial biological entities, and DNA. As a result, Prof. Fujita chose to study biology. Research appeals to Prof. Fujita because it enables him to investigate his hypotheses with experiments, and in the process, discover previously unknown entities and knowledge. Currently, he researches nitrogen fixation and chlorophyll biosynthesis at the Graduate School of Bioagricultural Sciences, Nagoya University, and contributes to solving environmental issues. Many studies conducted in Europe and the United States have investigated nitrogenase and have identified most of the genes necessary for nitrogen fixation. However, it is unknown whether embedding nitrogen fixation ability in plants can be controlled. The transcriptional regulator protein CnfR we identified in this research can be an important factor for this control. I would like to grant nitrogen fixation abilities to plants using this protein. I was a member of the Manga Club as a college student and enthusiastic enough to take my Manga draft to a publishing company. The skills I developed through Manga, such as constructing an interesting story, developing simple explanations, and effectively placing illustrations, have contributed to my scientific research where I develop a hypothesis, conduct experiments, make figures, perform presentations, and write articles. I hope that you will also devote yourself to your interests, which will help you in the future. Dr. Ryoma Tsujimoto was interested in bacteria that survive in ultimate environments when he was a high school student and chose to study at the School of Agriculture. Nitrogen fixation is a reaction that occurs in an anaerobic environment; therefore, his teenage interest influences his current research. 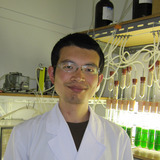 He enjoys his research at Nagoya University, where he can freely plan with his own ideas and conduct experiments. Granting nitrogen fixation to plants is the final objective of our research, but there are many problems to solve to this end. CnfR, which we discovered through our research, still requires extensive investigation; I plan to analyze its properties and functions through meticulous experimentation. In research, things never work out as you expect. I have experienced "no-win" situations many times, but sometimes these situations have led to unforeseen and interesting results that broaden my research. This is what I find appealing about research. I believe it is important to just have a go.